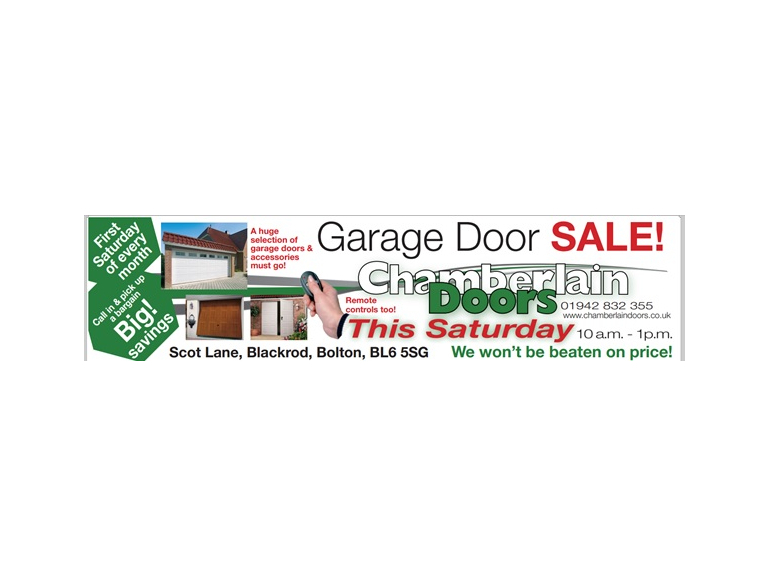 Chamberlain Doors are now holding a garage door sale on the first Saturday of every month from 10am-1pm. It all takes place at Chamberlain Door’s huge showroom, in Scot Lane in Blackrod. A massive selection of garage doors and accessories will be on display, including remote control garage doors, automatic doors, sectional doors, up and over doors, side hinged doors and roller doors. All the products are of the highest quality and meet Chamberlain Door’s high standards and reputable manufacturers. A support package and comprehensive warranty comes with all of Chamberlain Door’s products. Chamberlain Doors promise not to be beaten on price, so come along to experience big savings and pick up a bargain. There’s free parking too. It isn't the first time Chamberlain Doors have held such a sale. They last held one in February, but such was its success, they are starting the sale up again and making it a regular event. Of course, Chamberlain Doors have superb prices all year round. So even if you can’t make this sale, pop in during the week. Chamberlain Doors are open Monday to Friday 8am-6pm and Saturday 9am-4pm.